A Howard Elliott mirror design in a glossy royal purple lacquer finish. Accent any wall space with this stylish purple wall mirror. The frame is accented with a striking and detailed scroll design. Perfect for above a couch or bed for a stylish touch. Mirror only is 34" wide, 22" high. Hang weight is 19 pounds. Marry gentle curves and modern lines from this frameless arch mirror for a beautiful visual. 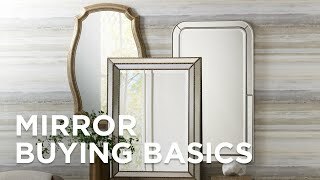 This transitional wall mirror combines classic and contemporary details to fit in many styles of decor. A mottled copper finish beautifully blends with beveled glass to create the glamorous design of this square wall mirror. Howard Elliott Nolan Dark Brown 24" x 72"
Perfect for a bedroomthe Nolan rectangular wall mirror can be installed vertically or horizontally for a multitude of versatile placement options.